What a difference Colman Domingo makes. Hands down, "Cobalt" was the finest hour of Fear the Walking Dead's first season, and it came right when it desperately needed it. Nearly every facet of the episode worked (as always, the less said about the Chris/Alicia scenes, the better). I'm actually looking forward to watching next week's season one finale- something I didn't think I would say at the season's start. Why did "Cobalt" work so well, when the previous four episodes were far less successful? Well, it appears the production team has finally recognized the show's strengths, and has decided to play to them rather than trying to force the show's less successful characters to take the lead. 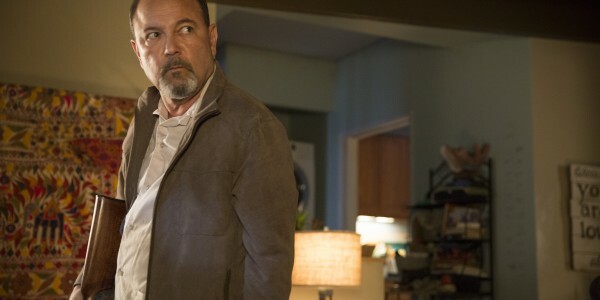 Rubén Blades and Kim Dickens are the strongest of the show's central actors, and putting the pair of them in scenes together elevates the material. Listening to Blades explain Daniel's actions in El Salvador was absolutely chilling. And watching Dickens' face as Madison learned what Daniel was doing to poor Corporal Adams? Well, I don't think Madison is going to have any troubling acclimating to this new world order at all. But aside from recognizing that the show has two superb actors within its troop (three when you count the new addition of Colman Domingo, but I'll get to that one in a minute), the series has began throwing its characters into murky moral situations, casting shades of grey over the designated series heroes. Daniel's torture of Adams was awful (although, considering how The Walking Dead occasionally seems to revel in gore, I was shocked at how little of the process was shown- a decision that made the situation all the more difficult to watch, frankly), but it did make Adams give up information he wasn't willing to divulge. Madison, our ultimate hero, was more than willing to look the other way and, even when confronted with what Daniel did, she was quick to rationalize his actions to poor naive Travis (who also got a rude awakening from his magical world where the Army was there to help everyone). Knowing what is to come in this new world, and having watched the characters on The Walking Dead make similar choices and survive, it's interesting to see who in this group of survivors can stomach these choices- which will only become more commonplace as things progress. In this new reality, people have to make difficult choices, and sometimes the human cost is great. 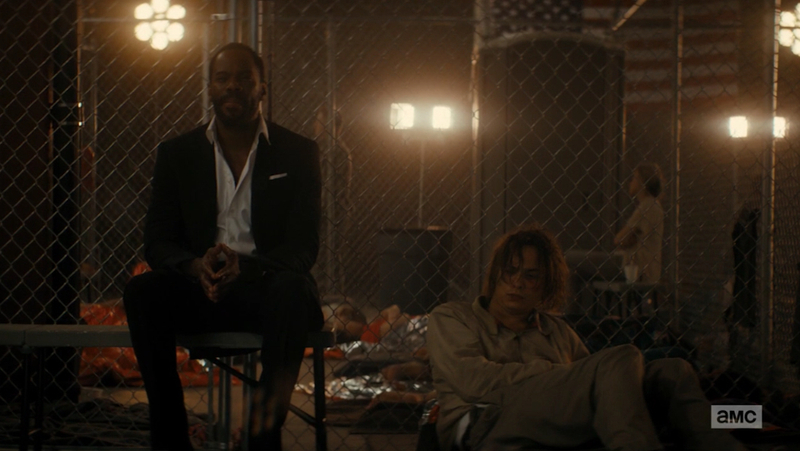 Speaking of surviving in this new world, I think we might have been introduced to the one man likely to survive in any awful set of circumstances: Strand (Colman Domingo). He's already a pro at playing the odds and removing the weak from the equation (although, I did sense some regret when he sent poor Doug off to, presumably, meet his doom). Domingo is charismatic and stole the episode. When a new character appears in the cold open and has you hanging off his every word, you know he's going to be something special. I'm far more invested in Nick's storyline simply from Domingo's presence in it. I would love to see Strand meet-up with Madison and Daniel. They would be a formidable team in the face of the apocalypse. With only one more episode left in this short first season, I'm unsure how the series will wrap things up. Will the gang get back together and set off on their own? I really hope we aren't treated to a long stretch of the group separated, as The Walking Dead taught us that the show is always stronger when the characters are close rather than searching for each other. Perhaps a big showdown with the military? A dramatic escape? We shall find out next week. 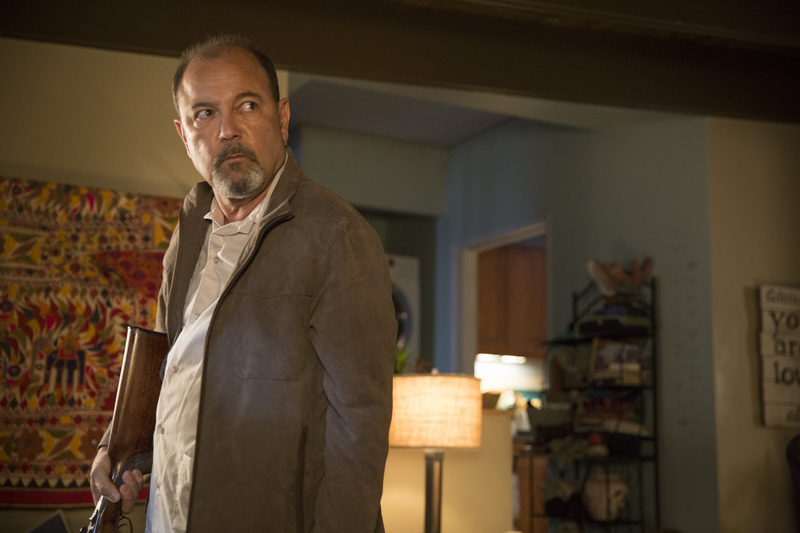 [caption id="attachment_74797" align="aligncenter" width="600"] Ruben Blades as Daniel Salazar - Fear The Walking Dead _ Season 1, Episode 3 - Photo Credit: Justina Mintz/AMC[/caption] Final Thoughts: -- If you want to read up on how truly awful humans can be when not in the midst of zombie apocalypse, I suggest reading up on the El Salvadoran Disappeared, which Daniel mentioned in the episode. -- I know I said I wouldn't talk about it, but that Chris/Alicia scene in the house was just plan bad. The hint of romantic tension was strange enough, but the breaking everything you can find? Ugh. I understand that for two teenagers who have officially lost any and all control over their lives, it was an act of asserting that power of control, but was it at all necessary? It just made the pair come off all the more annoying. -- I know I've been hard on poor Travis, but I think he's finally starting to come around. I don't think he'll ever be hard enough to handle this world (although, Carol did turn into one of the biggest badasses on television, so there's hope), but I'm glad he is recognizing that things are way worse than he initially thought. Chris and Alicia. Still the worst.